ALWAYS KNOCK LOUDLY AND WAIT FOR AN ANSWER BEFORE OPENING THE DOOR. It doesn’t matter if it’s 3am on a Sunday morning and your entire group is outside the door. Many people have a key to this lab and could be working in it. Remove all jewelry and any reflective surfaces on your person. 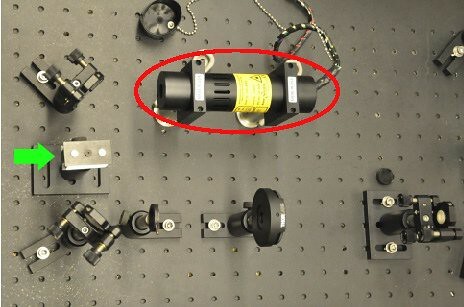 If one of these items accidentally crosses through the laser beam, the beam will reflect in unpredictable directions all over the lab, possibly into the eyes of you or others. IF THE LASER HITS YOUR EYE, YOU ARE BLIND. IF THE LASER HITS YOUR EYE, YOU ARE BLIND. Not for an hour. Not for a few days. You will never see anything you love ever again. This is not meant to frighten; it is just very important that these safety measures are followed. This is the SPCM. There are two switches on it. The power switch should be ‘off’ when you enter the lab, and the counting switch should be ‘safe’. If they are not, switch them into this position. The counting switch should never be in ‘count’ mode when the SPCM is ‘off’. The proper switch on sequence is ‘on’, ‘count’. The SPCM can be ‘on’ with lights on, but must be in ‘safe’ mode. When going to take counts, first turn off all lights in the lab, close the door, and face the computer monitor away from the lab table. This will minimize the light that might interfere with the SPCM. The cables leading into the SPCM have filters, but too much light could leak through the cables themselves. This means no other light sources should exist while the SPCM is in ‘count’ mode. The only exception is the green LED source in the lab; although this light should be off too if possible, it can be used to make fine adjustments without having to shut everything down and turn everything off. Most of the beam passes straight through the crystal, so this central beam is still dangerous! Make sure to always be aware of what level your eyes are at. Beam-height is the easiest height to “eyeball” alignments, but is also the most dangerous. The laser-safe goggles can help in this regard, but are not foolproof, so always be aware of where your eyes are in relation to the laser. In general, never touch actual optics components. All components have bases, stands, and dials for fine controls. Touching a component such as a mirror, lens, or crystal makes it unusable. 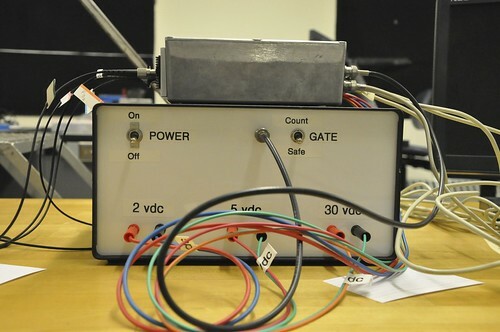 When leaving the lab, or before running a test of some kind, verify that no parts are ‘loose’; all parts are “dogged down,” or screwed into the table. A component falling over could also cause it to be unusable. Fiber Optic Cables: Because of how fiber optic cables work, there is some minimum radius of curvature of each fiber optic cable. This is what causes the cables to fall in wide loops on the table. When manipulating the cables, take care to keep the loops at least this radius- trying to loop them tighter breaks the cables. Each cable end appears radially symmetric, but is not. There is a small ‘notch’ on one side of the radius, corresponding to matching ‘notches’ in any lens or component the cable will plug into. When plugging in a fiber optic cable, make sure these notches are carefully matched, as scraping the end of the cable over the inside of the other component could make it unusable. When an end is not attached to a component or in transit to one, cover it with the plastic caps created for this purpose. As a corollary to this, never work alone. Know where your eyes and the laser are at all times. Help keep those around you out of dangerous situations as well. Despite all of the delicate equipment and dangers, don’t let the setup paralyze you with fear. Have fun safely!